In honor of players Kayla and Abby Kulikowski’s mother, the BHMS community joined together in a teacher versus student fundraiser to benefit LLS. The dictionary defines the word “team” as a group of people working together to achieve a common goal. Bunker Hill Middle School girls basketball coach Lisa Bramante’s definition of the word — her basketball players. The girls showed a true display of teamwork after organizing a fundraiser in honor of players Kayla and Abby Kulikowski’s mother, Michele, who was diagnosed with leukemia in October. 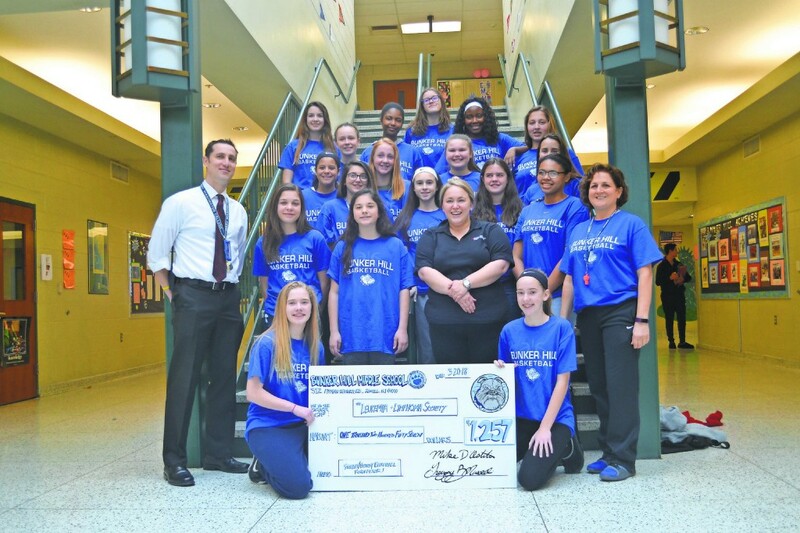 The team — with the help of Bramante and BHMS students and staff — was able to present a $1,257 donation to the Leukemia and Lymphoma Society on March 20, after hosting a successful teacher versus student basketball game on March 9. Bramante said she wanted the sisters — both in eighth grade — to know they’re loved at BHMS. “That’s the great thing about being part of a team, is to know that you have that group, that support,” Bramante said. “We wanted to do something for my mom, and Mrs. Bramante came up with the idea to come up with a teachers versus students basketball game, and all the money we raised would go to the Leukemia and Lymphoma Society,” Kayla said. Bramante got permission from the girls’ mother prior to putting the event together, as the money was donated in Michele’s name. Michele said Bramante really kept an eye on her daughters through the process, making sure they were OK. The support that filled the gymnasium was evident to Michele, whose entire family attended the fundraiser. While her two girls played against the teachers, her oldest son — along with her mother and sister — attended the game, her husband reffed, and her second-oldest son, who is corps commander for the high school’s ROTC program, brought in the honor guard. Michele also delighted in seeing the students and teachers coming together. Michele was diagnosed in October, after an injury during a soccer game landed her daughter Kayla in the hospital. She had been feeling short of breath, fatigued and weak — but as a mother of four, assumed the exhaustion was a result from constantly running around, between work and travel sports. “We went to the emergency room — she was cleared of a concussion, but they wanted her to take a few days off of sports. And then within the hour, I was at Jefferson. They diagnosed me with Acute Myloid Leukemia,” Michele said. According to Genna Toye, campaign director for the New Jersey chapter of the Leukemia and Lymphoma Society, BHMS has raised more than $16,000 for LLS over the years.